Google announces Android 9 Pie (Go edition) for entry-level smartphones. As part of the release of Android 9 Pie, Google today introduced a brand new Go edition experience. With Android (Go edition), Google aims to bring the latest Android improvements to more entry-level phone buyers. 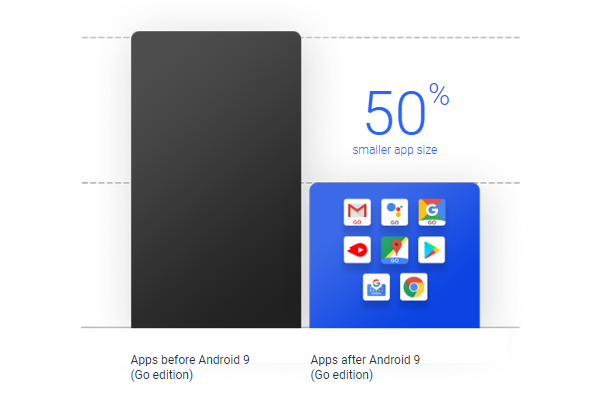 Android Pie (Go edition) comes with up to an additional 500MB out of the box compared to Oreo (Go edition), and more than twice what you'd find on a non-Go edition phone. Collectively, these features help solve some of the most common pain points for entry-level device owners: storage, performance, data management and security. Google Go now offers the ability to read webpages aloud and highlights each word so you can follow along. YouTube Go makes it easier to enjoy videos while using less data with new features like gallery mode for downloaded content. Maps Go now features navigation, making it possible for people with Go edition devices or unstable connections to use turn-by-turn directions whether you’re traveling by car, by bus, or on foot. Files Go, which has saved users ~90TB of space since launch, is now capable of transferring data peer-to-peer, without using mobile data, at speeds up to ~490Mbips. Assistant Go now supports additional languages including Spanish, Brazilian Portuguese and Indonesian, and has expanded support for device actions like controlling Bluetooth, camera and flashlight, and added reminders. Android Messages App for Android (Go edition) is now ~50 percent smaller in size and the Phone App includes caller ID and spam detection. Keep an eye out for the first devices offering the new Pie (Go edition) experience to hit shelves later this fall.